With the dreaded half-term fast approaching I have a suggestion for parents and grandparents who wish to introduce their children/grandchildren to Nelson Mandela. Nonchalantly walk them up the stairs from York Way to the Royal Festival Hall as they get to the top they will see the wonderful portrait bust of Mandela. At this, they will inevitably ask “Who was Mandela?” to which you can reply well actually there is a fantastic exhibition all about him just around the corner – here you can play the Harry Potter card – underneath platform 22 of Waterloo station. Bingo, you’ve got them to invite themselves to a wonderfully educative exhibition about the life and times of one of the greatest leaders of modern times. Nelson Rolihlahla Mandela (1919-2013). The power of this highly impressive exhibition for me lies in the artefacts on display. And if I were showing a young person around this is what I would focus on. Take for example the wooden truncheon that one can actually pick up and hold whilst the audiovisual plays the sounds of screams and blows as black demonstrators are battered with the very same object. There is a card with his prison number 46664. This is Mandela in a 100 objects. There is a breathtaking recreation of his cell on Robben Island where he spent 18 years in prison. Under one’s feet, there is what looks like a rough brown doormat like those in the lobby of a hotel. In fact, they were his bedding. This was what Mandela had to sleep on exhausted after 10 hours breaking stones in the quarry. His overalls, pickaxe and spade are all on show. Again and again, it’s the physical objects that really make this exhibition compelling. There are also plenty of displays showing film footage and images. They are well done but don’t come close to the visceral power, shock and awe of the physical objects. Perhaps the most disturbing are the examples of street signage that institutionalized apartheid. I was taken aback by the juxtaposition of official signs declaring “Blacks, Coloureds & Asians”, “Whites Only” or “White Area” or “Non–White Shop”. Mandela’s humanity comes through loud and clear. That is well known but what the exhibition brings out so well is his genius for strategy and leadership. He somehow knew that the pen was mightier than the sword. Despite opposition from his own comrades he deliberately taught himself Afrikaans so that he could speak to the Boers on equal terms. After all those hours breaking stones he went back to his cell and studied for a degree from London University. He understood the importance of sport as a way of keeping up morale in prison. Again the objects – table tennis racquets and footballs – are on display. Famously he wore the green jersey of the Springboks at the Rugby world cup final. Alas, that is not included in the exhibition. Nelson Mandela: The Official Exhibition is the story of one such life. For the first time ever, you will follow closely the life journey of this extraordinary man. Travel back to where it all began, in the rural South African village of Mevezo, where he was born. You will walk through the political fires and prison experiences that forged his unshakable commitment to making a better world. 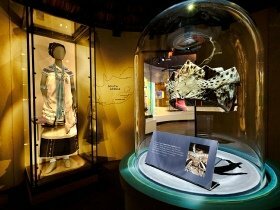 Experience a journey brought to life through state-of-the-art immersive and interactive galleries, previously unseen film, photos and personal effects. Together they uncover a story you thought you knew but will witness close-up for the first time. In his lifelong fight for freedom, justice, equality and education for all the world’s citizens, Nelson Mandela asked us all to ensure that the light of his legacy remain undimmed. Mandela: The Official Exhibition invites you to experience this life lived beyond borders and to continue to promote the values that he embodied during his remarkable lifetime. VENUE: 26 Leake Street Gallery, London SE1 2NN.